Facts and information about the History of Clothing and regalia of Native American Indians and their Bags and Pouches. As the Native American Indians of the Great Plains and other regions did not have pockets in their clothing they made a variety of different bags and pouches as a convenient way to carry their possessions. The bags and pouches were both decorative and functional. They were used to carry articles such as mirrors, face and body paints, “medicine” items, good luck charms, pipes, sewing equipment, dried food and tobacco. 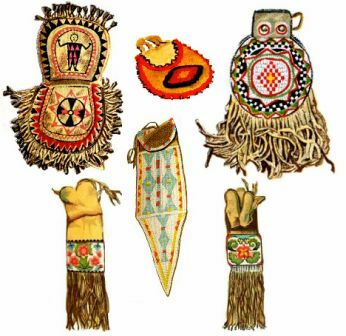 This article contains interesting facts and information about the bags and pouches used by Native American Indian tribes. The history of traditional or ceremonial dress and regalia worn by Native American Indians is a fascinating subject. The following fact sheet contains interesting facts and information on Bags and Pouches. Native Indians did not have pockets so a bag or a pouch was a necessary item. There were many different types, designs and styles, they were highly practical articles but contained extremely important articles and were often decorated with fringes, beads and quills. Bags and Pouches Fact 8: The Quiver was another form of bag or pouch carried by the hunters and warriors of the tribes. A Quiver was a portable sheath that contained arrows. Quivers were made of extremely tough material as it had be strong enough so that the arrows would not pierce the quiver. The arrows were typically placed tip side down in the quiver. Knife Sheaths were also another indispensable item.